In Catalonia, there has long been no other option: independence is the only remaining route to social justice after Spain’s dismissal of all attempts at dialogue over the years. 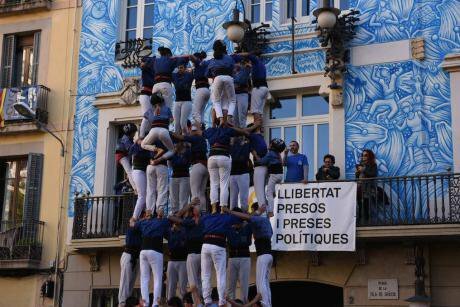 Traditional castellers (human towers) in front of a banner demanding ‘freedom for the political prisoners’ at Vila de Gràcia square in Barcelona. Jorge Sanz/PA Images. All rights reserved.On November 2, a Spanish judge sent the Catalan vice-president Oriol Junqueras and seven cabinet ministers to prison without bail, using an outdated penal code from Spain’s Francoist regime. Extradition warrants were also issued for Catalan President Carles Puigdemont and several of his ministers, who are currently in Brussels. Once again, thousands of Catalans took to the streets day after day to demand freedom for our political prisoners and to denounce Spain’s abuses of power and misuse of the law, culminating in the mass demonstration last Saturday, November 11 which stretched across more than a kilometre of Barcelona’s space. With the same aims, a general strike took place all across Catalonia on Wednesday, November 8. Its novelty was the mass blocking of roads and railways, with particular focus on those leading to France and mainland Spain, in order to bring our outrage to the national and international attention with the hopes that, eventually, pressure is put on the Spanish government to stop its repressive tactics and to free the political prisoners. Abroad, it could falsely seem that the Catalan question only erupted on October 1. However, understanding our political context is necessary in order to truly make sense of how we got where we are today and why we have declared independence unilaterally. The history of repression in Catalonia is long, but our history as a people is even longer. It starts centuries before the formation of the Spanish State, with a Catalan Constitution dating back to 1283 (while the Spanish one can be traced back to 1812). After the War of the Spanish Succession (1702-1714), Catalan institutions were destroyed and an oppressive military rule was established by the Bourbons. Throughout the centuries and decades that followed, Catalan institutions, rights, language and other cultural traditions were abolished and restored numerous times. As a result, this history of repression now constitutes an integral part of the memory of our people and is inseparable from our sense of collective identity. The history of repression in Catalonia is long, but our history as a people is even longer. Since then, many progressive laws conflicting with the right-wing agenda of the PP were rejected by the Spanish government after being approved by the Catalan Parliament: laws against energy poverty, fracking and evictions as well as reforms promoting gender equality, social security, taxation on nuclear energy and banks, and so on. In total, 25 laws approved by the Catalan Parliament did not come into force because they were repealed by the Constitutional Court at the request of Mariano Rajoy’s government. The widely-covered police brutality which took place during the referendum of October 1 has, at last, brought home the long-sought international attention to the repression that we experience. We reacted to this violence with peaceful resistance to reclaim our dignity and our rights, and issued numerous calls for dialogue with Spain and for international solidarity. 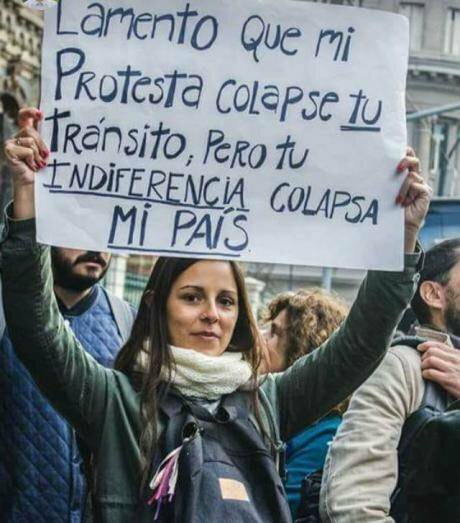 Protester during the general strike on November 8th holding a placard that reads “I regret that my protest is collapsing your transit, but your indifference is collapsing my country”. Júlia Montañà. Calls for dialogue and political negotiations to deal with the Catalan question have been issued eighteen times by Catalan leaders since 2006, calls which Madrid has dismissed every single time. Faced with the impossibility of agreeing on organizing a referendum with Spain, the Catalan Parliament finally voted in favor of organizing a referendum unilaterally. During his speech on October 10, instead of declaring independence, Puigdemont attempted to reach out to Spain one more time by temporarily suspending the declaration of independence to start a dialogue with Madrid. President Mariano Rajoy responded with a threat of direct rule. On October 26, once more at risk of losing all support from separatists, Puigdemont nearly declared autonomic elections in order to avoid direct rule. In the end, however, he did not do so, as Rajoy did not guarantee that Puigdemont calling for elections – and thus ignoring Catalonia’s independence process – would stop Madrid from implementing Article 155. Catalonia’s wish for dialogue with Spain could not be clearer; it is outlined in its new declaration of independence, which states: “we affirm our will to open negotiations with the Spanish State”. It should also be emphasized that the declaration of independence came with a call for tolerance, peace, inclusiveness and collaboration as well as the explicit will to incorporate the voices of those who disagree with independence into shaping the formation of the new republic. Meanwhile, with the hope of winning the next elections and eclipsing the numerous corruption scandals in Spain, the PP’s discourse blames the Catalan government for causing a fracture within Catalan society, all the while taking measures and actions demonstrating their disrespect – if not outright animosity – for the Catalan people, as shown by the recent brutality of the police. The widely-covered police brutality which took place during the referendum of the 1st of October has, at last, brought home the long-sought international attention to the repression that we experience. The hate speech used by some PP leaders and leaders of other parties such as Ciutadans (a relatively new neoliberal party in Spain), has fostered the mobilization of pro-unity, ultra-right-wing groups – a significant factor in the so-called societal fracture for which Puigdemont is being blamed. So far, the only politically-charged, violent actions have been police brutality and attacks by members of pro-unity, ultra-right groups against Catalan people in Catalonia and Valencia, some of them taking place after the two mass pro-unity marches in Barcelona. On the day that independence was declared, two Catalans were hospitalized after being attacked by a group of ‘ultras’, while other pro-Spanish-unity groups attacked a Catalan radio station. To date, the latest attacks were on Saturday, November 4, when a group of ultras led an attack after a pro-unity demonstration, shouting “Viva Hitler!”. So far, two activist leaders have been put in prison for sedition for helping to mobilize the mass demonstrations and the incredible organization of civil society actors that was necessary for the celebration of the referendum on October 1. Today, members of the Catalan Parliament are being sent to prison for rebellion, omitting that for an act to be considered rebellious within the Spanish penal code it needs to include violence by the person accused. This does not come as a surprise in a country that ranks 58th in the World Economic Forum’s ranking of judicial independence, directly below Kenya, Lithuania and Botswana. However, Spain fails to understand that this is not a process dictated by high-ranking politicians; it is a process led by the people. It is precisely the grassroots nature of the pro-independence movement which allowed for the successful organization of the referendum. It is the people who mobilized en masse to prevent the arrest of 14 politicians charged with sedition on September 20th. It is the people who took part in the general strike against police violence after the referendum. It is the people who are now organized to peacefully resist direct rule and retain power over our institutions, in our workplaces and our daily lives. These same people will go on general strike on Wednesday 8th of November to demand freedom for our political prisoners. Rajoy’s government can imprison Catalan politicians, but there will never be enough prisons in Spain to imprison all of us, let alone the ideals of freedom we hold. Our struggle will live on despite Spain’s imprisonment of current leaders. Spain fails to understand that this is not a process dictated by high-ranking politicians; it is a process led by the people. As a matter of fact, it is the Spanish Government which has been acting outside the constitution. The measures of direct rule taken on Friday, October 27, justified through the application of Article 155, are actually not within the remit of the constitution. Article 155 only enables the central government to issue instructions to autonomic governments or authorities, not to take over the autonomic government and its functions, as is currently being done by the Spanish vice-president under direct rule. Taking control of the Catalan government is not only illegal, it is also undemocratic. To implement direct rule and govern a territory where the PP only won 8% of the votes in the past elections would hardly “restore democracy and give Catalonia back to Catalans” as Rajoy has claimed. Furthermore, in doing so, the PP is clearly violating the fundamental right to self-determination embedded in the Human Rights Charter, as recently highlighted by UN Human Rights Council Independent Expert Alfred de Zayas last Thursday. The question remains as to whether a majority of Catalan people want independence or not. For some of us, the long-sought declaration of independence came as a bitter-sweet result. There is nothing we would have liked more than to be able to vote in a referendum that was not blocked – by the Spanish confiscation of letters on voting procedures, the shutting down of websites, censorship of media and police brutality amongst other actions. We tried our absolute best, we put our collective will before our physical strength, to enact a referendum where everyone had the chance of voicing their opinion. Despite the multiple ways in which the referendum was coerced, it is estimated that around 56.8% of the census would have voted on October 1, but only 43.0% of voting ballots could actually be counted as the rest were stolen by the police amidst batton kicks. Amongst the votes that could be counted, 90.2% of voters supported independence. This means that for ‘no’ to have won this referendum, over 77.6% of the population should have gone to vote and all the stolen votes and all the people who did not vote should have voted ‘no’. Considering that the highest turnout in the history of Catalan elections is 77%, it is unlikely that, given the current referendum results, the majority of the population was against independence. Nonetheless, some pro-independence parties have committed to participating in the autonomic elections of December 21st and to respect the will that voters will then express, retracting independence if a majority of voters support pro-unity parties. However, Spain’s imprisonment of pro-independence leaders this week hints that the coming elections will be far from fair. We are living through a fascinating instance of dual, conflicting legalities. The “Transition Law” agreed upon in the Catalan Parliament, and direct rule – presumably an interpretation of Article 155 of the Spanish Constitution – both claim to govern Catalonia today. The one that will eventually govern us will be the one that Catalan people chose to abide by in the coming days and the one which foreign countries observe. The Spanish government’s current intervention in Catalonia is the continuation and the culmination of its pursuit of and ambition for full power over Catalonia. We are accused of disobedience, and the Spanish government uses our disobedience to justify the implementation of direct rule. Please know that we have no other options but to disobey. Should we have retracted and called for autonomic elections, thus abandoning the current “Transition Law”, the Spanish government would still implement direct rule under Article 155. In fact, PP leaders recently indicated that even if pro-independence parties win once again the elections due on December 21, direct rule will be maintained so long as their electoral program advocates Catalonia’s independence. We were put in the situation of choosing between declaring independence unilaterally or losing all of our autonomy. We made our decision and are ready to stand by it in the face of threats, coercion and repression. We implore other countries to stand by us too, understand our reasons and recognize the Republic we are aiming to build. We call on people worldwide to put pressure on governments to recognize Catalonia as a Republic, to condemn the manipulative use of the law by Spain and to mediate a process that finally gives all Catalans a voice. An easy action that you can take now is going to supportcatalonia.eu and sending an automatic letter to your representatives, or connecting to your local branch of the Catalan National Assembly (ANC) and getting informed on future events, publications or ways to be involved. I would like to thank Marta Musić immensely for making this article possible and for her absolutely touching solidarity.